Queen Elizabeth II and Kate Middleton had their first outing together. 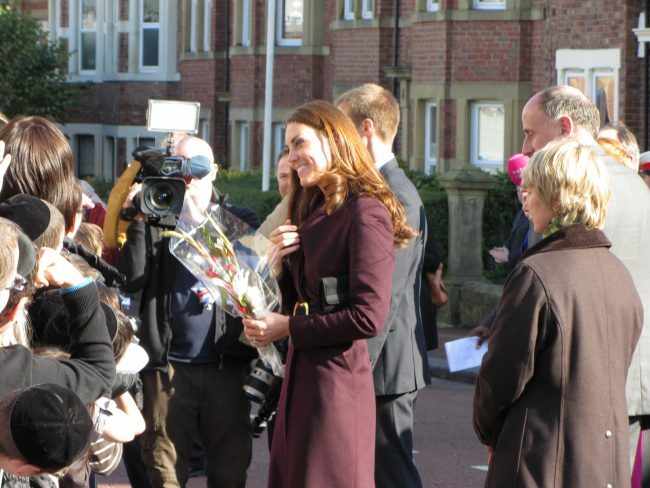 The queen and the Duchess of Cambridge shared a calendar event for a visit to King’s College on March 19, 2019. While there, the royal mother of three and Queen Elizabeth II officially opened Bush House, the latest education and learning facilities on the Strand Campus. This is the first time the two have had an outing together since Middleton joined the royal family in 2011. Middleton wore a gray Catherine Walker belted flared dress, while the queen wore a bubblegum pink Stewart Parvin coat with a matching Rachel Trevor-Morgan hat over a floral dress. During the outing to the university, for which the queen serves as a patron, Middleton and Queen Elizabeth II took in the view from the rooftop terrace to watch a robotics demonstration and then visited the virtual trading floor. While chatting with a student developing an app for reading, Middleton learned more about the student’s plans to allow users to choose stories depending on the amount of time they have to read. Middleton stated that it would be good for her children before they go to bed. Additionally, she noted the student is considering adding children’s stories to the app. At the end of the day, the queen unveiled a plague to formally open Bush House before the two signed the visitor’s book.